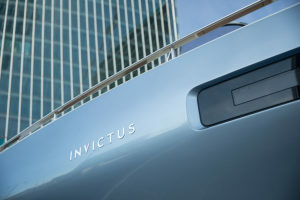 A “special edition” of the Invictus GT280 model is the star of the IN-OUT exhibition, which for the second year is conquering the spacese of the modern CityLife district in Milan, during the eagerly awaited Fuorisalone of the Milan Design Week, from 8th to 14th of April. special “Blu Milano” colour, which highlights its “half-reverse” bow. Sturdy and cutting at the same time, it develops with plain, skilfully crafted sides, with very homogeneous transitions between full and empty spaces. The only exceptions are the cabin area and the motor air inlets – simple slits that underline the monolithic features favoured by Christian Grande. Surfaces are treated as if they were carved out of a full volume and they convey strength that can withstand any conditions of use and the fiercest waves. “City Life is where the future of style, elegance and exclusivity lands in Milan this year,” declares Christian Grande. “In this ideal port, cross-roads of trends and inspiration and shaded by the towers reflecting spring skies, the Invictus GT280 Blu Milano is moored. This is the special edition of a boat that, like all classics, never ceases renewing itself and is always surprising. The ever-refined details are combined with the energy of a colour that vibrates in the sun and wind – the perfect manifesto of a city that does not want to stop exploring new routes”. 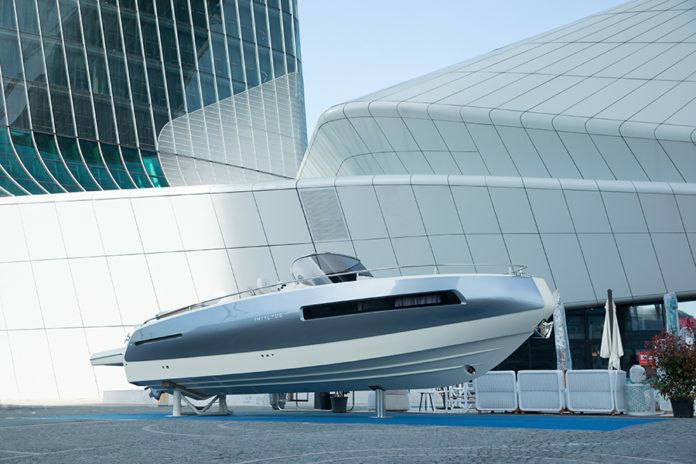 In this outstanding exhibition context – which proves that boats are not just a means of transport but a true expression of outdoor life – Invictus is supported by Nautica Bertelli, the official distributor for northern Italy, Switzerland and Austria. offering a chance to reflect on outdoor life through a number of exhibition platforms, in what has been named a “wundersquare”, a square of wonders in which everything is designed to provide well-being. The co-organisers of the second edition of the event, in addition to Studio Rotella, are Sergio Rossi from Fierecom & Events (who designed the SUN in Rimini), Barbara Colonnello from the Promoest event planning agency, and Class Editori, which will be an event partner through the Telesia and the special MF Living communication channels. IN-OUT has the patronage of the Municipality of Milan, of the Italian-Chinese Chamber of Commerce and of the Italian Trade Agency.